At age 29, Reverend Takie Okumura of Japan set sail for Hawaiʻi in 1894. He was initially appointed to serve as minister of the Japanese Christian Church, the predecessor to today’s Nuʻuanu Congregational Church. In early-1910, the Makiki Japanese Church (later known as the Makiki Christian Church) introduced the custom of one English sermon per month. The Church acquired property near McKinley High School (at the corner of Pensacola and Elm.) Then, in the 1930, a new, enlarged church was contemplated and then constructed. It was modeled after a Japanese Castle. The “Makiki Castle” was the inspiration of the Reverend Okumura. Okumura asked Hego Fuchino to design the church. Born and educated in Japan, Fuchino immigrated to Hawaiʻi at age 17 or 18 and worked his way through ʻIolani School and the University of Hawaiʻi. He worked as a land surveyor and engineer in Honolulu while he taught himself architecture, and became one of the first Japanese architects in Hawaiʻi. One of Fuchino’s earliest works was the Kuakini Hospital, which he designed in 1919. He designed the Izumo Taisha Mission; commercial buildings; movie theaters such as the Haleiwa Theater; residences and apartments; and schools such as the Hawaiian Mission Academy. Inspired by the early-Edo period Himeji Castle in Japan, the church is the only Christian church in the United States to be modeled after a sixteenth-century Japanese castle. The Makiki Christian Church is a five-story redwood building whose main tower rises ninety feet above street level. A three- story parish hall and Sunday school, built four years after the tower, extends out from the tower to give the building a T- shaped floor plan. Rather than a building associated with war, Okumura indicated that the castle was a place of defense, meant to provide protection and peace, and that the earliest known building erected in Japan for Christian worship was Tamon Castle. In November 1932 the tower was completed and in 1936 the Parish Hall was added to the church. The churchyard is entered from the Elm Street side through a munekado (a gable-roofed gate supported by two pillars). The building’s entrance is fourteen feet high with a pair of massive solid wooden doors. A large vestibule, thirty feet in height, runs parallel to the sanctuary and provides access to the church and the parish hall wing. The interior includes acid-stained concrete floors, columns with elbow brackets, and 164 ceiling panels depicting fruits, flowers, and vegetables painted by Yunosuke Ogura. 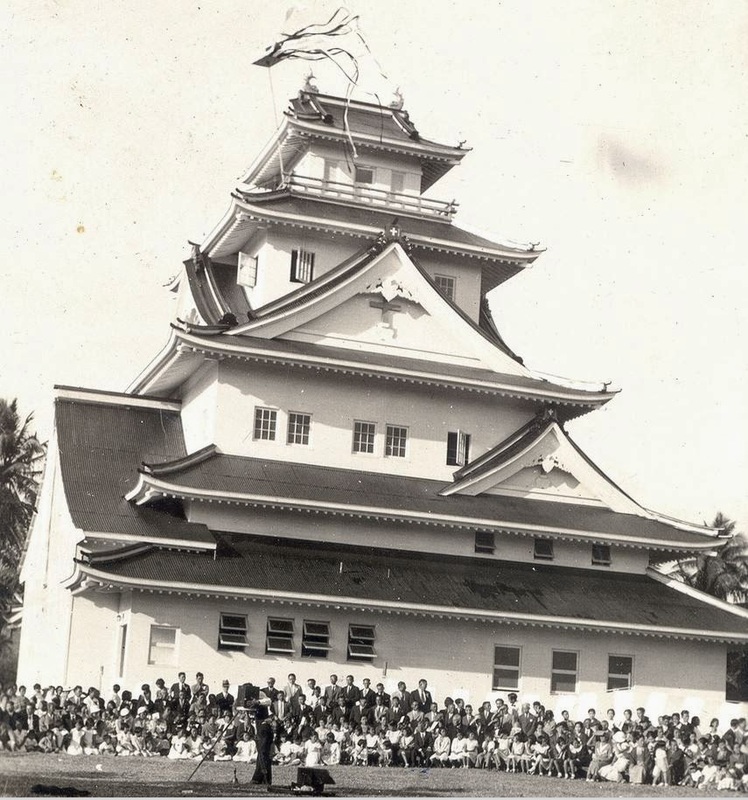 Before he died in 1951, Okumura also established the Okumura Boys and Girls Home, which provided young men and women affordable housing; he started the first Japanese-language school and the first AJA baseball league. Makiki Christian Church is listed on the Hawaii Register of Historic Places (No. 80-14-9719, dated September 30, 1988;) it is one of the most photographed churches in the Islands. The image shows an early look of the Makiki Christian Church. In addition, I have added other images in a folder of like name in the Photos section on my Facebook and Google+ pages.